A review requested by Robert Lovejoy, with thanks for contributing to the Second Quinquennial Antagony & Ecstasy ACS Fundraiser. 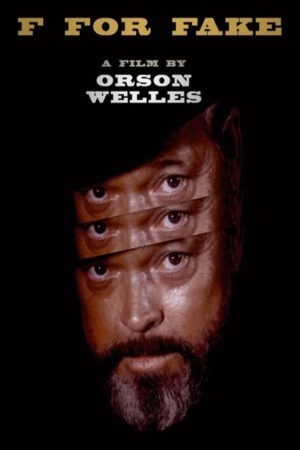 In all the annals of unclassifiable films, I can't think of anything quite as unclassifiable as 1973's F for Fake, the penultimate completed feature of Orson Welles's directorial career (only Filming 'Othello' followed it). It's customarily identified as a documentary, and then customarily the hedging begins to the effect that, whatever the hell it is, "documentary" is a misleading word. It's part of the vaguely-defined tradition of the "essay film", movies which are ruminations on themes divorced from storytelling and intoxicated with using the medium itself to build an argument; but inherent to the notion of the essay film is that all of the best ones (and F for Fake is, I think, easily one of the best) don't resemble anything but themselves. They are sui generis. The ingredients that go into F for Fake are, already, rather twisted up to the point that it's a matter of some controversy as to what existed at what point, and who's responsible for assembling it. But the basic shape of the thing is that French director François Reichenbach was preparing a documentary about Elmyr de Hory, an art forger who had just been the subject of a biography by Clifford Irving, published in 1969, with the monolithic title Fake. This was shaping up to be an intimate but stylistically conventional work of cinéma vérité, based on the footage that pops up in F for Fake, and that's when the bomb dropped: Irving's follow-up to Fake, an "as told to" autobiography of the legendary recluse Howard Hughes published in 1971, was discovered to be a complete fabrication. Around the time that this was discovered - one of the controversies concerns in exactly what order things happened - Reichenbach gave his de Hory footage to Welles, and signed on as cinematographer for the new project that the American filmmaker was going to build out of that foundation. That new project was a treatise on the concept of fakery in multiple guises, including the act of making F for Fake itself; although Welles, narrating in full raconteur mode, promises us at the three-minute mark that everything we're told in the next sixty minutes of film is going to be the simple, pure truth, the editing and implications of his film are at the very least misleading, if not patently untrue. But then, by the two-minute mark, he's already freely owned up to being a charlatan. And that means laying claim to footage directed by others (Reichenbach and Oja Kodar, Welles's partner for the last quarter century of his life), re-assembling that and his own footage into mixtures whose implicit meaning is quite different from unadorned reality, and generally letting his subjects and himself spin a good story and worry about of the details lining up perfectly only as a tertiary concern. Nor, really, does the film ever pretend otherwise. Welles clearly learned a lot from the Godardian Wing of the French New Wave that was still quite fresh in memory in the early '70s; by the third shot of F for Fake, in which we openly see the film crew making the movie we're watching, it's clear that this will be an enthusiastic participant in the trend of self-aware formalism by which a movie spends its entire running time reminding us that it's a movie, and that it was assembled by people with some kind of agenda. And still before that spurious "the next sixty minutes" claim, we've already heard Welles describe fakery, fraud, and lies under the affectionate umbrella of "hanky panky", the phrase cropping up at exactly the moment that the editing ramps up into a whirlwind of shortened attention and confusing jumps between unconnected images. The rest of the film blasts through fragments of the de Hory and Irving stories, blended with snippets of Welles sharing anecdotes about them, himself, and other people he's known, the director appearing as a garrulous spectre all in black with a bushy beard to dominate the foggy empty spaces where he talks directly to us or the fancy restaurant table where he entertains a group of hangers-on with his theatrically-scaled way of talking. From the opening, which finds Welles on a train platform dazzling a child with magic tricks - the editing working double-time to make sure we can't tell if the little boy is truly seeing the marvels Welles is playing, or if he's just an actor responding to the most boring kind of cinematic sleight-of-hand - the topic of the film is at least as much Welles as a showman, desperate to please and keep us off-balance with the twists and turns of his tale-telling. "Sorry, I've been jumping around like this because that's how it was", he apologises at one point, but of course that's a lie too. He's jumping around because it delights him to do so, and it gives the film the frenzied patter of a magician who lets himself appear to be sloppy and confusing because that's the actual way he keeps us from looking. For among all its other charms, F for Fake is, essentially, structured as a feature-length magic trick with a single punchline that has nothing to do with Elmyr de Hory or Clifford Irving. It's a hellaciously daunting movie, throwing curveball after curveball at high speed throughout, bragging about the lies its tells and inviting us to enjoy being lied to; for that is, ultimately, the real theme of F for Fake. Not that liars exist because people like de Hory, Irving, Welles, or Oja Kodar's grandfather, another art forger, can monetise tricking people; liars exist because people like to be tricked. It is the amateur magician Welles who recognises that, not the world-class filmmaker Welles, which perhaps explains why this is so unlike anything else in his career. But it's the filmmaker who translates that observation into purely cinematic terms, using some of the canniest editing I've ever seen to misdirect and guide the viewer to exactly the responses that Welles wants, while telling such colorful true and somewhat less-true stories that it's a delight to be manipulated. Everything about the film is densely packed and even a bit wearying; 89 minutes is as long as this could dare to be, though it has the decency to end with a nice cool-down to ease us out of it. The filmmaking throughout is giddy and self-infatuated, and I will concede that of all the movies I've ever firmly believed to rank among the very best ever made, F for Fake is one of the most absolutely frivolous; its demolition of filmmaking technique is intellectually stimulating but not, ultimately, very complex in the annals of self-aware cinema. But very great it nevertheless is: a bold, brazen movie that could only have been made because a top-notch talent decided to show off for a little bit. Sure, it's indulgent, but indulgence is rarely this captivating.